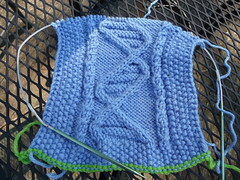 Also called the Double Helix Seaman Scarf. This is 1 whole pattern repeat and 10 rows of the second pattern repeat. I'd almost considered ripping it back from this point because I'm not too sure about that super thick border, but now I'm not.